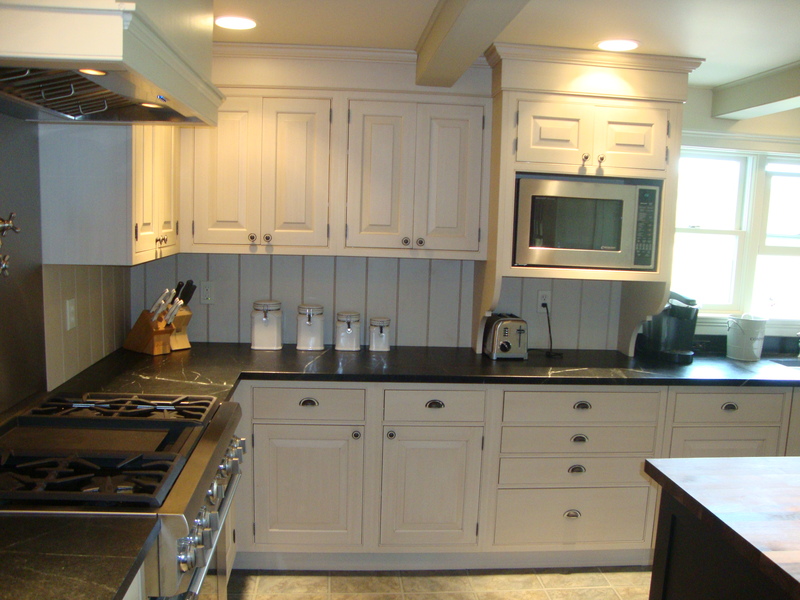 Kitchen cabinets can make or break a kitchen. 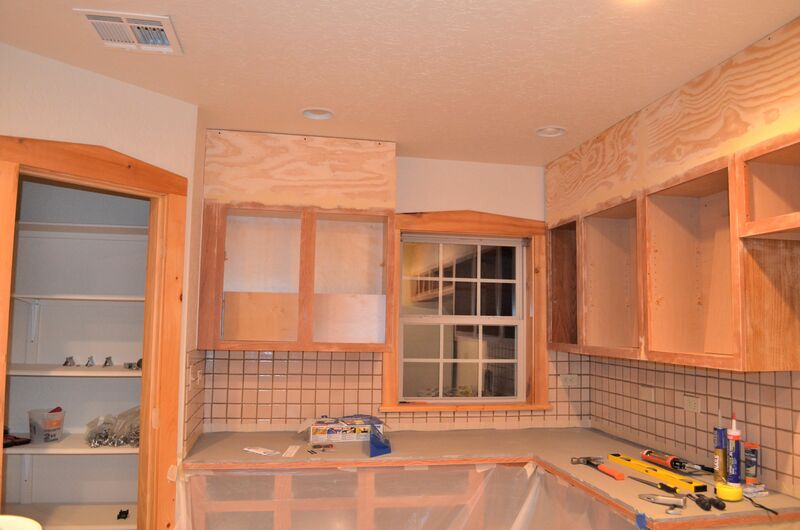 And the longer we are in kitchen reno mode, the more I realize I am particular about cabinets. 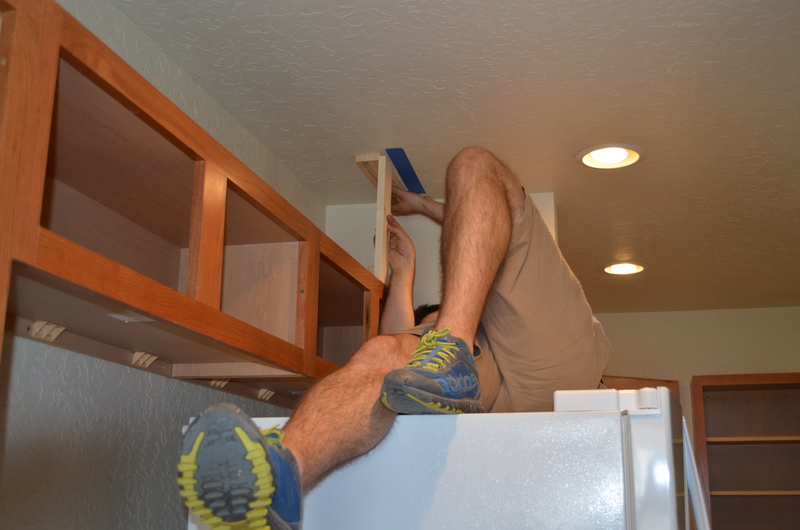 I realized that I don’t really like low cabinets. 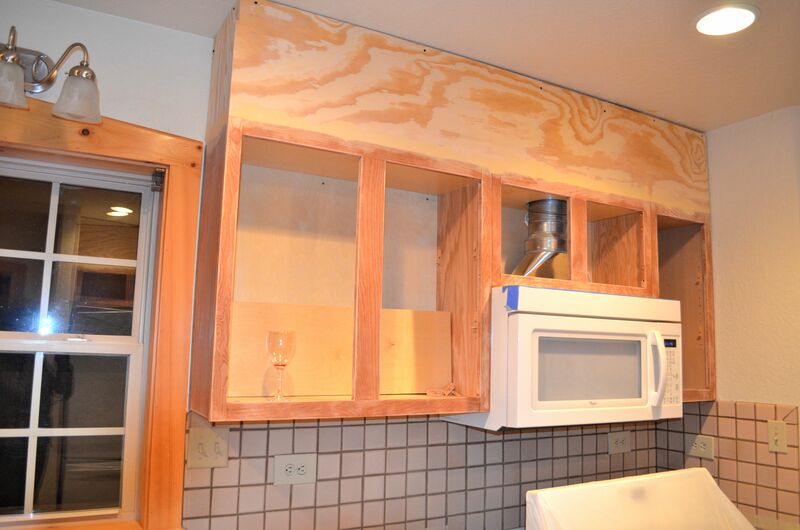 Low cabinets meaning there is a gap between the cabinets and the ceiling. I know a lot of people enjoy them and use the space for decorations. However, that’s not my style. 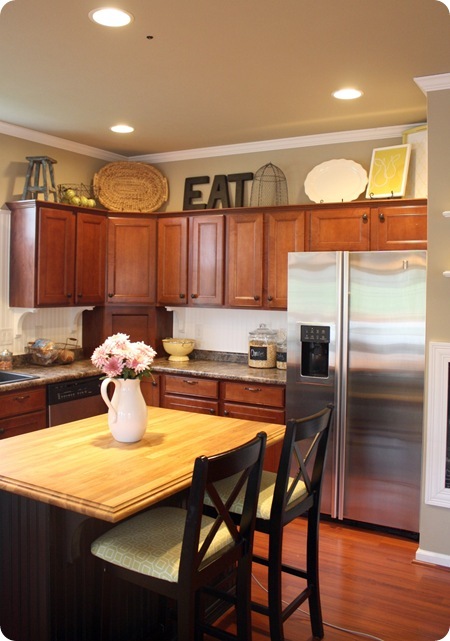 If you are not an avid duster, decorations above cabinets get very dusty and besides for looking nice, they don’t really do much for me. Plus I hate dusting. 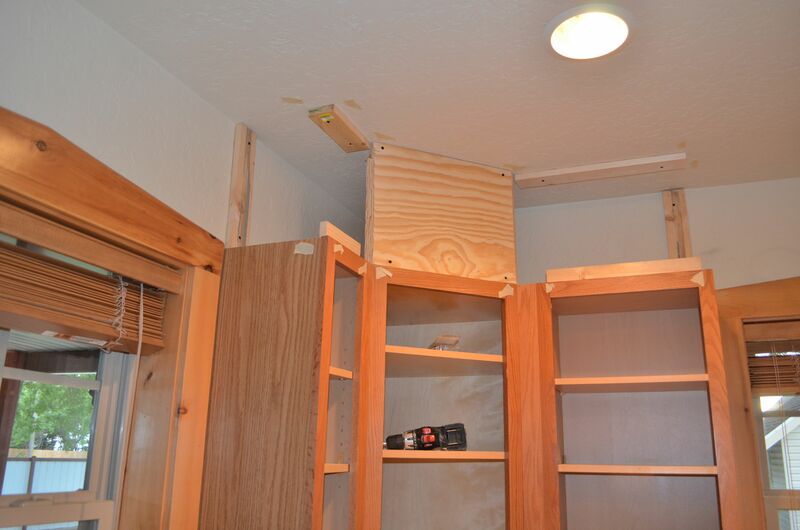 I prefer cabinets that reach the ceilings and eliminates the gap. 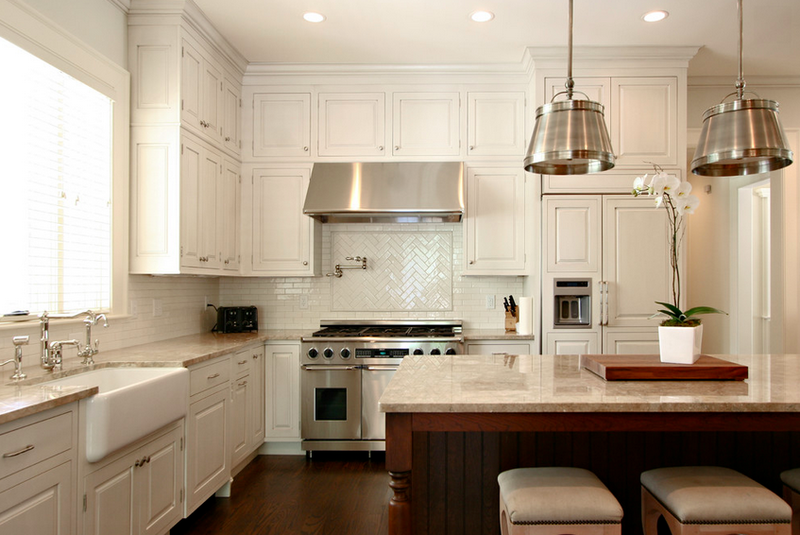 There is something gorgeous to me about tall cabinets. Gorgeous and grand. When I told Mr. HungryYogi this, he agreed. 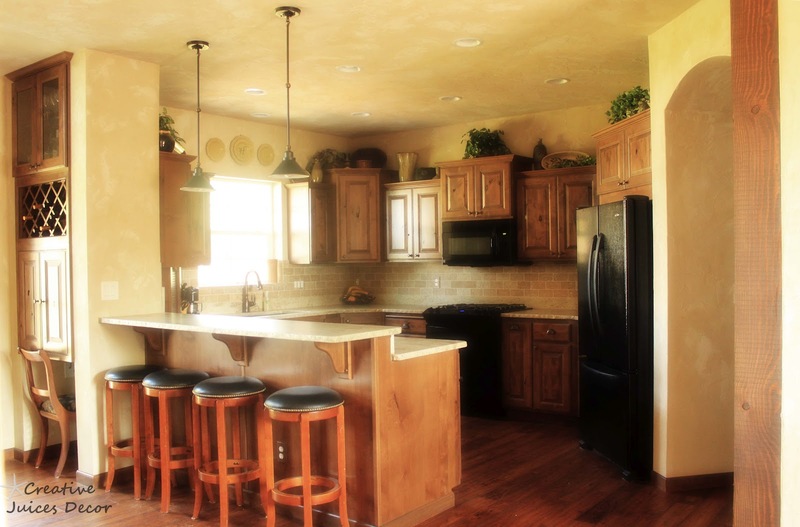 He said that moving the cabinets higher could work but that it would look funny because our back splash would be off. And then the brilliant man said he had an idea that could make it work. WARNING: What I am about to show you is going to look like a HOT MESS. However, I can assure you that it turned out GORGEOUS. I know a lot of bloggers show the reveal and then show the step by step process they took to get there… but call me a wildcard. I want y’all to see what I had to see, in the order I had to see. 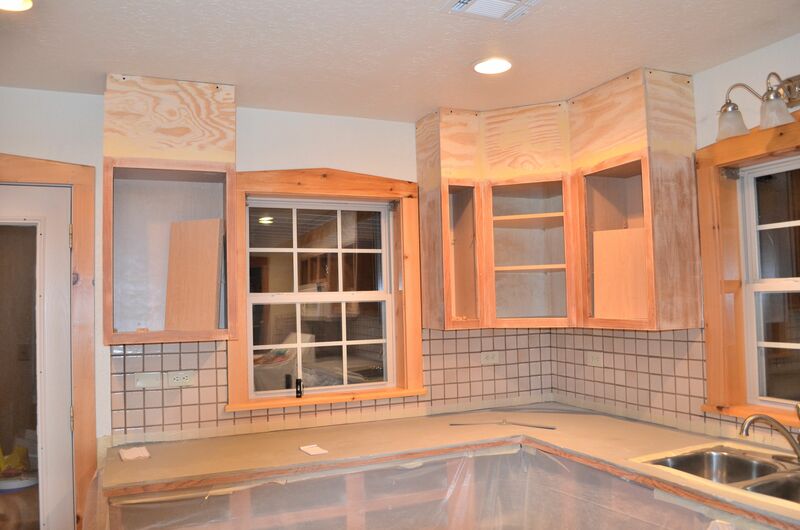 I didn’t get to see how awesome the end product looked until after all the hard work was complete. I just had to have faith that it would look good. And let me tell you, it turned out fantastic. Mr. HungryYogi said he could do it. 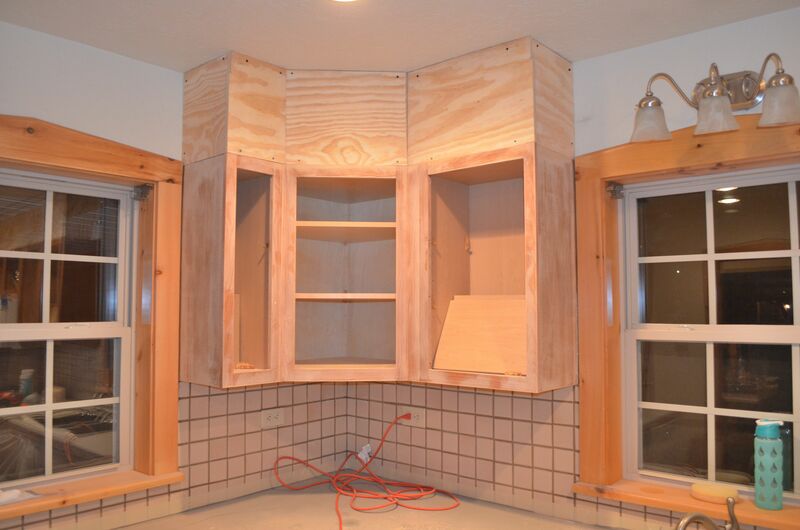 He said he could make my dream cabinets a reality for our current kitchen. And he did. But not without it looking a little shady at first. 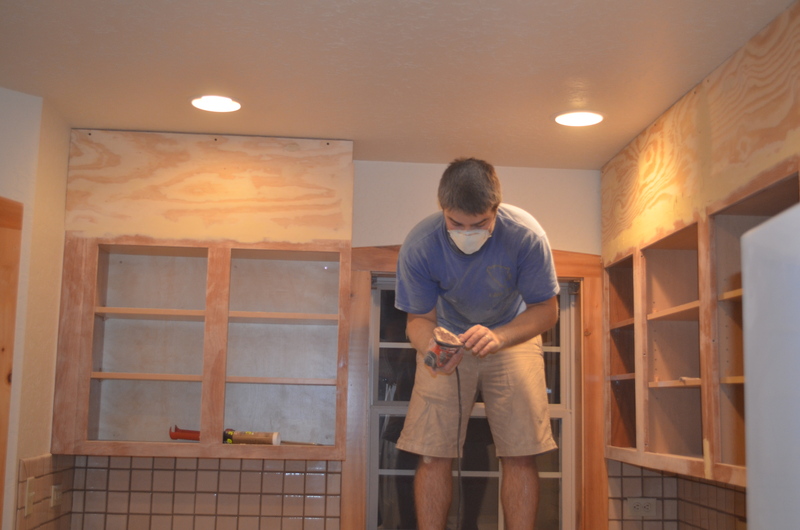 In order to make our cabinets appear larger he said he would need to fill the gap with wood. So off to the lumber store we went. He picked up some wood, got it cut down to fit in our little Saturn (we had to have the trunk opened as we drove home because even cut down, they were too big) and we went home to measure, cut down some more, and start sealing off the gap. 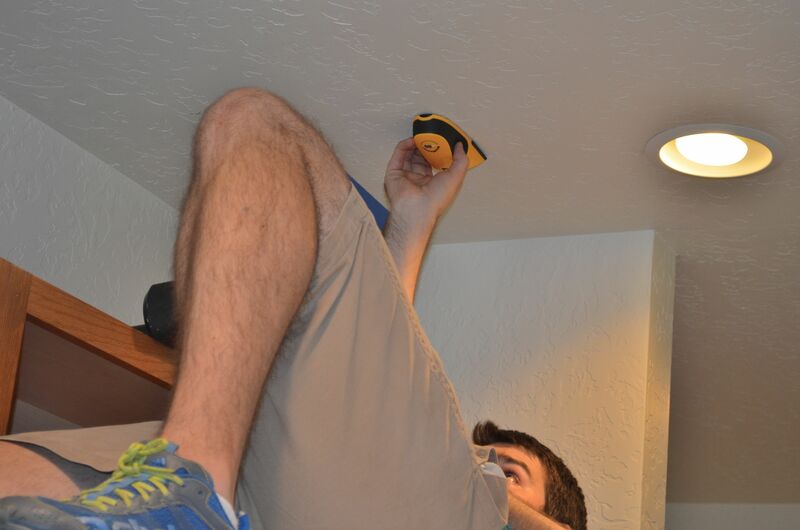 He used a stud finder to find were he could drill screws for the boarder. 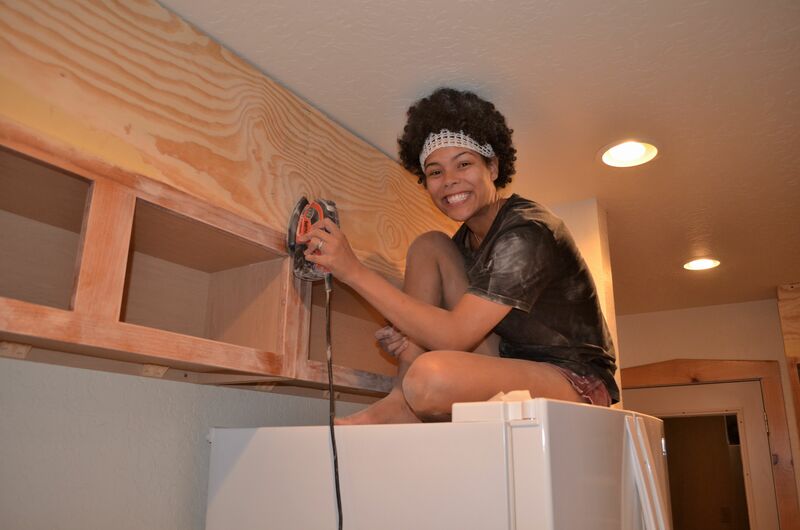 And slowly started making a boarder for the cabinets. 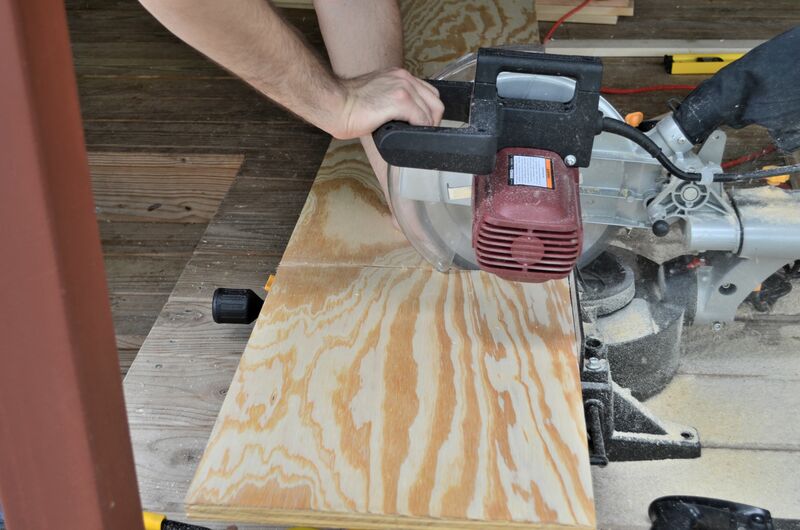 The boarders were needed because we would line the wood on top of them and have something to drill into. 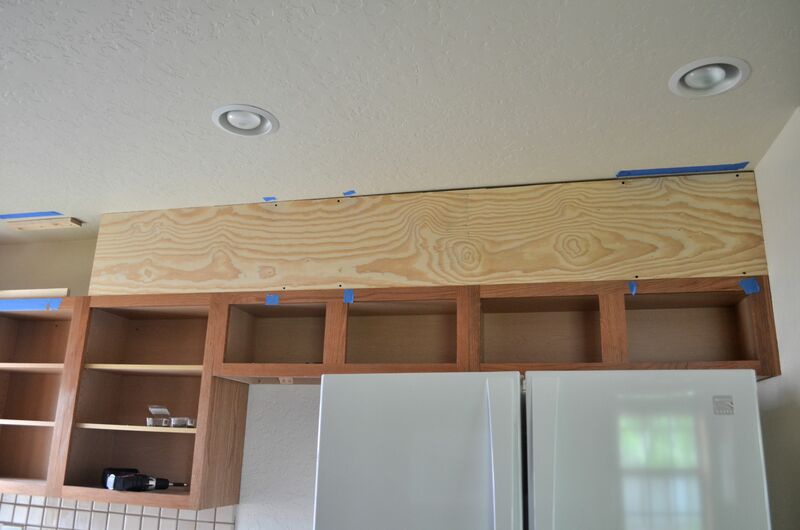 He made a boarder around all of the kitchen cabinets. And then it was time to get the wood up to fill the gap. He measured the area and then used his saw to cut down the wood. He was really worried about this spot because of the angles. 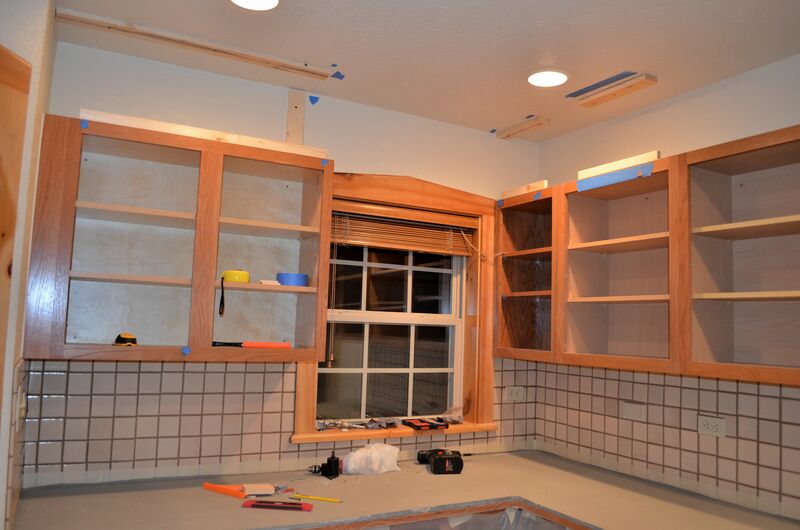 He said that this spot would make or break this project. And like a champ, he figured it out. We filled all of the gaps. 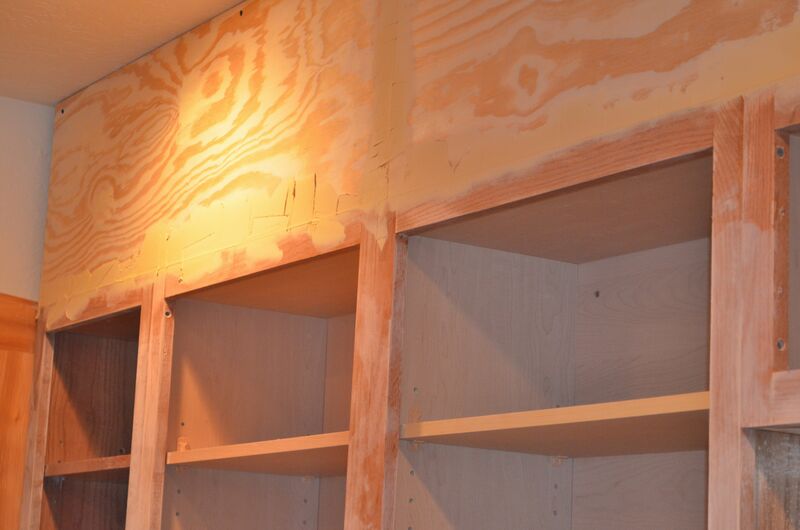 And then we added wood putty to all of the spaces and imperfections in the wood. so that it looks flawless. 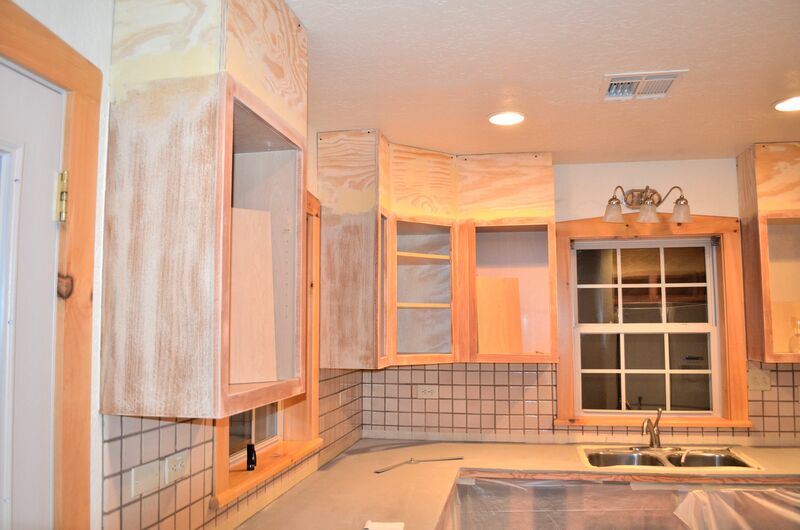 Mr. HungryYogi said he wanted these cabinets to look like they were always this way. That’s how serious he was. And if you touch where the seam would be, you would just feel a smooth transition. As a whole, it looks shady right now. But I promise that it looks amazing all finished. 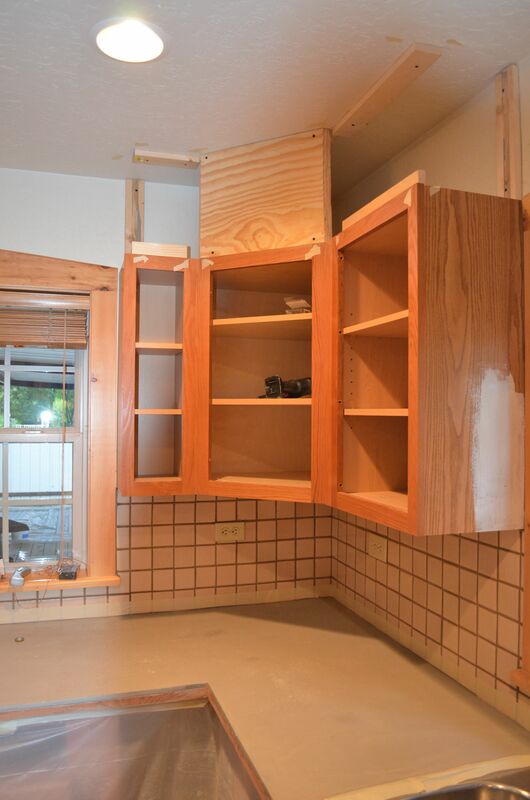 My mom has cabinets like this…and hates them she wishes she could store stuff there. 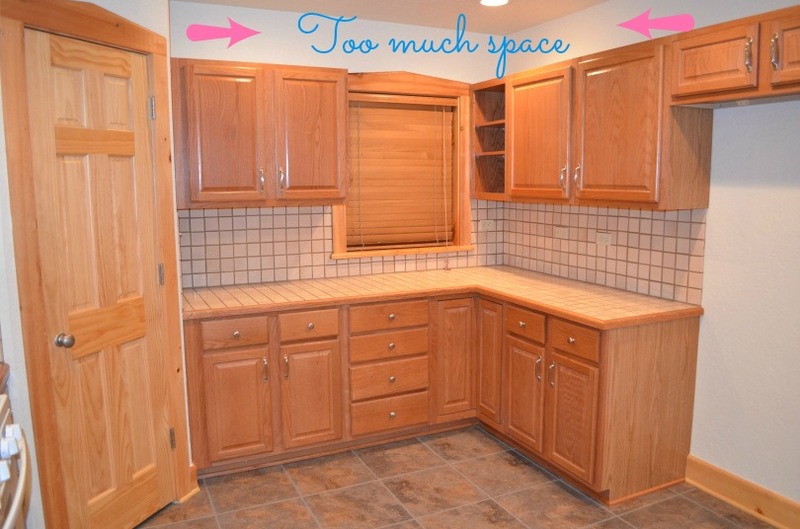 I am trying to convince her to remodel and if we do we are putting the small above the fridge cabinets there for more storage, tho her kitchen is a lot smaller than yours, 15 cabinet doors, including under the sink. And um 4 drawers. So she needs the storage. If when I get hers going I will probably blog about it too. Yes it is,what color are you staining the concrete and where did you find that?